For more information about these tags see our protein tag guide. All of our peptide tags are available with five different protease cleavage sites including: Enterokinase (EKT) / Rhinovirus 3C (PreScission) / Tobacco Etch Virus (TEV)/ Thrombin (Throm)/ Factor Xa. For more information on these enzyme sites, please see our cleavage tag guide. 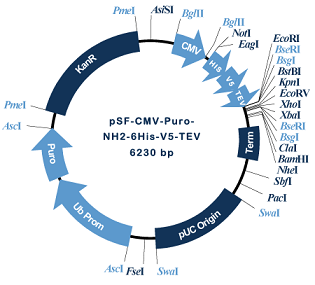 The plasmid structure shown contains a 6His affinity tag and a V5 epitope tag, both upstream of a TEV cleavage site, all positioned upstream of the MCS. When you insert your gene of interest into the MCS, both the functional tags and the cleavage site will be positioned at the N terminal of the expressed protein. This will allow you to produce your protein, purify and characterise it, and simply remove the tags (using TEV proteolysis) if you wish. We have literally hundreds of variations on this structure, to meet your precise requirements. If you want a plasmid that provides functional tags alongside a secretory tag (signal peptide), to engineer secretion of your protein product from mammalian cells, please check out the products on our mammalian secretory tags page. We also provide plasmids encoding reporter gene tags (fusion proteins) including Renilla and Firefly luciferase, Beta Galactosidase, Alkaline Phosphatase, Chloramphenicol Acetyl transferase and a range of fluorescent reporters. Please see our reporter gene page for more information. Please use the Tables below to find the mammalian tag plasmid you require. Alternatively you can search using the Plasmid Search tool, or browse our tags catalogues using the buttons at the bottom of this page. If in doubt, please contact us. Histidine tags (His tags) can be easily encoded within DNA sequences and be positioned at either end of the protein. They can be used both for purification of proteins and also for detection by western blotting. Traditionally purification has involved adsorption of the protein to nickel or cobalt chromatography columns, followed by elution with a base. However anti-His antibodies are efficient for detection and can also be used successfully for purification in a range of formats. Most his tags are hexahistidine (His6) although His10 is also available, and binds more strongly to the nickel and cobalt columns. His tags are suitable for purification of many proteins, including those that need to be purified denatured. Histidine has a weak positive charge at neutral pH. His6 has a molecular weight of 930 Da, while His10 is 1550 Da. Harvest and lyse host cells with expressed histidine-tagged protein, and clarify by centrifugation. Incubate the lysate with a slurry of Nickel beads (eg Ni-Sepharose). I ml of 50% slurry can bind about 20 mg of His-tagged protein. Pack the slurry into an empty disposable PD10 column. Oxford Genetics provides a broad range of plasmids containing N-terminal and C-terminal His tags, both His6 and His10. In some plasmids the tags flank reporter genes, while in others they are positioned adjacent the MCS enabling you to insert your own gene in frame as required. 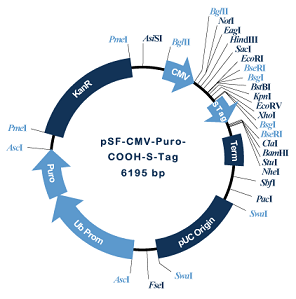 The plasmid structure shown contains a hexahistidine tag positioned downstream of the MCS, allowing simple inclusion of the tag at the C terminus of your gene of interest, driven by the CMV promoter. The structure also includes an Enterokinase cleavage site for simple removal of the tag following protein production, if required. The plasmid also contains puromycin resistance, driven by the ubiquitin promoter, for selection in mammalian cells, together with kanamycin resistance for selection in bacteria. Our online catalogue contains a diverse array of plasmid structures, accessible via the buttons below. Our Plasmid Builder facility also provides a simple means for you to design an efficient strategy for any modifications or cloning manipulations to these plasmids. Finally, as always, although we have designed these plasmids for simple and efficient cloning, we are happy to undertake any cloning steps that you prefer to outsource. You can access all these options through the Plasmid Builder button below. The V5 epitope tag is derived from a peptide present at the C terminus of the P and V proteins of simian virus 5. It contains 14 amino acids, from N to C: GKPIPNPLLGLDST. Oxford Genetics provides a range of plasmid vectors containing V5 tags in a range of orientations, to meet all your cloning requirements. Please browse through our products using the ‘Browse Plasmids’ menu. For example we provide V5 at both N and C sides of the MCS, allowing versatile positioning of your gene, we sell it with and without enzyme cleavage sites (for simple removal of the tag, if required, after protein production), and we sell it in a range of configurations with affinity tags (such as hexahistidine) to give you maximum flexibility. The V5 tag is an epitope tag, meaning there are good antibodies that recognise it specifically. This makes it especially useful for immunoprecipitation, immunofluorescence and western blotting. Incubate the lysate with a slurry of gel beads bearing V5-capture antibodies, centrifuge and wash carefully. Elute the bound V5-tagged protein and its binding partner(s) with a buffer containing the free V5-elution peptide GKPIPNPLLGLDST. Oxford Genetics provides a broad range of plasmids containing N-terminal and C-terminal V5 tags. In some plasmids the tags flank reporter genes, while in others they are positioned adjacent the MCS enabling you to insert your own gene in frame as required. The plasmid structure shown contains the V5 tag positioned downstream of the MCS, for inclusion at the C terminal of your inserted gene. The plasmid also contains puromycin resistance, driven by the ubiquitin promoter, for selection in mammalian cells, and kanamycin resistance for selection in bacteria. The Thioredoxin (TRX) tag is used predominantly to increase the solubility and thermal stability of proteins expressed in bacterial systems, where it also assists in the refolding of proteins requiring a reducing environment. It also provides a useful epitope tag, and has a molecular weight of approximately 12 kDa. Oxford Genetics provides a range of plasmid vectors containing TRX tags for use in bacterial cells. We provide TRX in a range of orientations, to meet all your cloning requirements. Please browse through our products using the ‘Browse Plasmids’ menu. For example we provide TRX at both N and C sides of the MCS, allowing versatile positioning of your gene, we sell it with and without enzyme cleavage sites (for simple removal of the tag, if required, after protein production). We also sell it in a range of configurations with other tags (such as hexahistidine) to give you maximum flexibility. TRX and many TRX fusion proteins are stable at 80°C, allowing initial purification by heat treatment to precipitate other proteins. Oxford Genetics provides a broad range of plasmids containing N-terminal and C-terminal TRX tags for mammalian, bacterial and yeast systems. In some plasmids the tags flank reporter genes, while in others they are positioned adjacent the MCS enabling you to insert your own gene in frame as required. The plasmid structure shown has a TRX site downstream of the MCS, to be positioned at the C terminus of your gene of interest. The plasmid also provides a hexahistidine site, for improved purification, and both can be removed from the protein produced by Prescission cleavage of the 3C site, if required. The S-tag is derived from the N terminus of RNase A. It is a 15 amino acid sequence that is used as an epitope tag and also as a solubility tag. The sequence is: Lys-Glu-Thr-Ala-Ala-Ala-Lys-Phe-Glu-Arg-Gln-His-Met-Asp-Ser. S-tag is suitable for use in many different cell types and has a molecular mass of 42.5 KDa. Oxford Genetics provides a range of plasmid vectors containing S-tags for use in mammalian, bacterial and yeast cells. We provide S-tags in a range of orientations, to meet all your cloning requirements. Please browse through our products using the ‘Browse Plasmids’ menu. For example we provide S-tags at both N and C sides of the MCS, allowing versatile positioning of your gene, we sell it with and without enzyme cleavage sites (for simple removal of the tag, if required, after protein production), and we sell it in a range of configurations with other tags (such as hexahistidine) to give you maximum flexibility. Pass the lysate slowly through an affinity column containing anti-S-Tag antibodies and wash carefully with buffer. Oxford Genetics provides a broad range of plasmids containing N-terminal and C-terminal S tags for mammalian, bacterial and yeast systems. In some plasmids the tags flank reporter genes, while in others they are positioned adjacent the MCS enabling you to insert your own gene in frame as required. The plasmid structure shown contains an S-Tag positioned downstream of the MCS, to be linked at the C terminal of your gene of interest. 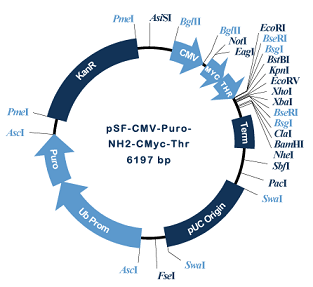 The plasmid also contains puromycin resistance driven by the ubiquitin promoter. c-Myc tags are decapeptide tags derived from the c-myc gene product that can be encoded within DNA sequences and be positioned at either end of the protein of interest. C-Myc tags can be used for affinity purification, co-precipitation and also as epitope tags for detection by western blotting. Anti-c-Myc antibodies are efficient for detection in a range of formats. The c-Myc tag sequence, from N to C: N-Glu-Gln-Lys-Leu-Ile-Ser-Glu-Glu-Asp-Leu-C. It has a molecular weight of 1202 Da. Incubate the lysate with anti-a-Myc antibodies and a slurry of Protein A-capture gel beads, centrifuge and wash.
Elute the bound c-Myc-tagged protein with one of (a) a low pH glycine buffer, (b) SDS, (c) high pH urea buffer. Oxford Genetics provides a broad range of plasmids containing N-terminal and C-terminal c-Myc tags. In some plasmids the tags flank reporter genes, while in others they are positioned adjacent the MCS enabling you to insert your own gene in frame as required. The plasmid structure shown contains the c-Myc tag upstream of the MCS (where you can insert your gene of interest under the CMV promoter) and provides a thrombin cleavage site, allowing you to remove the c-Myc tag after production of your protein if you wish. It also contains the puromycin resistance gene under control of the ubiquitin promoter, for selection in mammalian cells, and kanamycin for selection in bacterial cells. The MBP tag is derived from the E. coli maltose/maltodextrin system and is widely used as both a solubility tag (notably for recombinant proteins grown in E. coli) and also as an affinity tag, since it binds to amylose columns. MBP has a molecular mass of 42.5 kDa. Oxford Genetics provides a range of plasmid vectors containing MBP tags for use in mammalian, bacterial and yeast cells. We provide MBP in a range of orientations, to meet all your cloning requirements. Please browse through our products using the ‘Browse Plasmids’ menu. For example we provide MBP at both N and C sides of the MCS, allowing versatile positioning of your gene, we sell it with and without enzyme cleavage sites (for simple removal of the tag, if required, after protein production), and we sell it in a range of configurations with other tags (such as hexahistidine) to give you maximum flexibility. Pass the lysate slowly through an amylose column and wash carefully with buffer. Oxford Genetics provides a broad range of plasmids containing N-terminal and C-terminal MBP tags for mammalian, bacterial and yeast systems. In some plasmids the tags flank reporter genes, while in others they are positioned adjacent the MCS enabling you to insert your own gene in frame as required. The plasmid structure shown includes an MBP tag positioned upstream of the MCS, for inclusion at the N terminus of your gene of interest, and an EKT cleavage site allowing simple removal of the MBP, if required, after protein production. Expression is regulated by the TEF1 promoter in yeast cells. The structure also contains URA3 for selection of transfected yeast cells in uracil-deficient media, and kanamycin resistance for selection in bacteria. FLAG tags are octapeptide tags that can be encoded within DNA sequences and be positioned at either end of the protein of interest. FLAG tags can be used for affinity purification, co-precipitation and also for detection by western blotting. The FLAG tag is synthetic, and was designed to be small and hydrophilic, to exert minimal effects on the structure of proteins it is linked to. Anti-FLAG antibodies are efficient for detection in a range of formats. The FLAG tag also contains an intrinsic enterokinase (EKT) cleavage site, for tag removal after it has fulfilled its purpose. The FLAG tag sequence, from N to C: DYKDDDDK . It has a molecular weight of 1012 Da. Incubate the lysate with a slurry of FLAG-capture gel beads, centrifuge and wash carefully. Elute the bound FLAG-tagged protein and its binding partner(s) with a buffer containing the free FLAG-elution peptide DYKDDDDK. Oxford Genetics provides a broad range of plasmids containing N-terminal and C-terminal FLAG tags. In some plasmids the tags flank reporter genes, while in others they are positioned adjacent the MCS enabling you to insert your own gene in frame as required. The plasmid structure shown contains a FLAG tag upstream of the MCS, allowing you to position it simply at the N terminus of your gene of interest, and an enterokinase (EKT) site is also provided that allows simple removal of the FLAG tag from the purified protein if you so wish. In this case a BM40 (osteonectin) secretory tag is also included, to allow efficient secretion of your protein from the expressor cells. Our online catalogue contains a broad range of plasmid structures, accessible via the buttons below. Oxford Genetics Ltd provides the largest collection of protein tags in the world, with over 1500 peptide tag variant plasmids for most research purposes. We can also easily create any new tag you need on request if we haven’t got the combination you need already. When choosing which protein tag to use it is important to consider your required application. Some tags are much more efficient than others for certain applications and the table below may help you decide which to use. Typically, affinity tags are useful for protein purification, whilst solubility tags can be useful for increasing yields (but often also for purification). Epitope tags are typically useful for protein detection, but can also be used for purification but this is generally more expensive than using affinity resins because they require large amounts of antibody for purification. As general rule you can normally find antibodies against most of the tags available, so technically they can all be used for detection and/or purification, but using certain methods for some tags can be much more expensive and some can produce less pure protein preparations. If you require any further information regarding our product range then please contact us for more information.